Project Alloy, Intel's first VR and mixed reality headset, got a release date at CES. CEO Brian Krzanich said Intel will "productize" Alloy in Q4 of 2017 i.e. 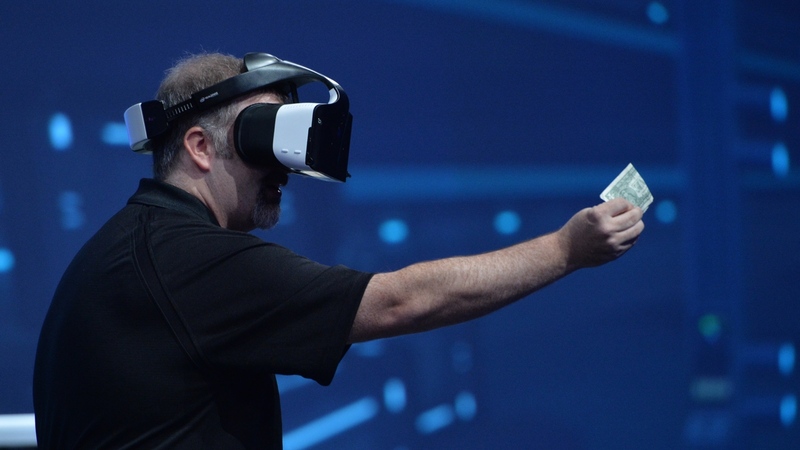 by the end of the year and that untethered headsets like it are the "future of VR". Intel had laid its mixed reality cards out by unveiling Project Alloy, a prototype connected headset, at the Intel Developer Forum last year. With features that resemble an Oculus Rift crossed with a Microsoft HoloLens, Alloy won't be made by Intel. Instead, the chip maker wants to power 'merged reality' headsets by other tech companies. That said, we *still* don't know who will manufacture the first Alloy headset(s), just that it will be some of Intel's "top OEMS". Essentially it's a completely wireless VR headset with some additional mixed reality features such as real world object recognition and offering the ability to see your own hands and fingers while in VR. Like the Vive, it will warn the wearer if they are about to walk into a wall or a couch too. Specs are still scarce but the tech involved is centred around Intel's own depth-sensing, room-scanning RealSense cameras, which we've seen before on the Daqri AR Smart helmet. The RealSense tech can scan items of furniture in the room and then map virtual game elements on them too. The latest demo at CES 2017 even showed how two people can wear Alloy and move around in the same room and not bump into each other. And the hand tracking doesn't need any external HTC Vive-style sensors placed around the room, the headset includes motion sensors. We said it's completely wireless and, in another deviation from what we've seen so far, Project Alloy won't be tethered to a PC or any controllers, it will be powered by a seventh gen Intel Core processor. It's a self-contained VR machine. Also at CES, Krzanich talked about livestreaming app Voke VR which uses Intel's tech and announced that it's coming to the Oculus Rift later this year. Computer vision company HypeVR also got some attention - its volumetric capture and playback engine shot and recreated a live action 3D waterfall scene that VR viewers were then able to walk around, as we've seen with CG animation. "Ultra high resolution" HypeVR videos will come to Alloy headsets in 2017. Brian Krzanich, Intel's CEO, wrote in a Medium post: "Merged reality is about more natural ways of interacting with and manipulating virtual environments — by liberating you from the controllers and the nun chucks of today's VR systems by immersing your hands — your real-life hands — into your simulated experiences thanks to readily available new sensing technologies." There's some interesting ideas with Project Alloy though perhaps not enough to seriously worry Microsoft, Sony and HTC too much. In short, with this new release date, Intel will be a little late with its open VR hardware platform.